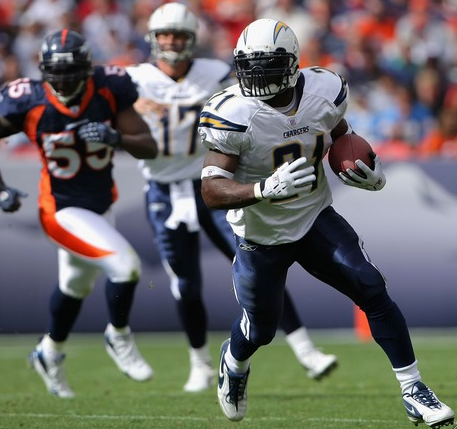 The San Diego Chargers finally played to their potential on Sunday beating the Denver Broncos 41-3. San Diego improves to 2-3 with the victory while Denver drops to 2-3 as well. The Chargers dominated the Broncos in every phase of the game especially in the turnover battle. San Diego did not turn the ball over once, a far cry from their last few games and they forced 3 turnovers. The bolts started the game on the right foot, forcing Denver to punt on their first possession. RB LaDainian Tomlinson and TE Antonio Gates carried the Bolts down to the goal-line and QB Philip Rivers finished the drive off with a 2-yard TD on a bootleg to the right. On the ensuing kickoff, LB Carlos Polk crushed the Denver KR forcing him to fumble. The ball bounced off a few people and into the air but eventually landed in the hands of rookie LB Brandon Siler who returned the fumble 23 yards for a TD to give the Chargers a 14-0 lead with 6:15 left top lay in the 1st quarter. San Diego would force another turnover on Denvers next drive when S Marlon McCree nailed Denver WR Brandon Marshall with a fierce tackle forcing a fumble that was recovered by CB Quentin Jammer at the 9-yard line. San Diego opened up their next drive on the ground as they ran the ball on 6 of their first 7 plays for a total of 36 yards. 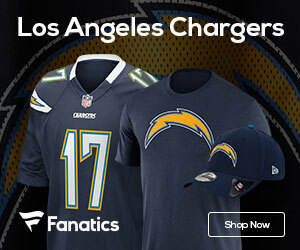 Rivers hit Tomlinson on a 29-yard screen pass to bring the ball to the 13-yard line but the drive stalled and K Nate Kaeding hit a 26-yard FG to bring the score to 17-0 with 11:23 left in the 2nd quarter. Denver and San Diego would go on to trade punts and then FG’s to end the first half with a score of 20-3. A 49-yard run by RB Michael Turner with :26 seconds left in the half set the Chargers up for their late half FG. San Diego opened the second half by marching down the field with a 2 key pass completions to WR Vincent Jackson for 24 and 45 yards, respectively. The drive was capped off with a 9-yard TD pass to TE Antonio Gates. S Marlon McCree ended the next Denver drive by intercepting a QB Jay Cutler pass. Rivers hooked up with Gates 3 times for 59 yards before finding Jackson for a 15-yard TD pass to give the Chargers a 34-3 lead. A good number of the 2nd string players were able to see time in the 4th quarter but none performed better than RB Michael Turner. He provided late game fire works and provided the game’s final score with a 74-yard TD run with 9:42 left to play in the game to bring the score to 41-3. LB Matt Wilhelm looked solid in his first action since injuring his calf 3 weeks ago as he and CB Quentin Jammer led the team with 6 tackles each. LB Stephen Cooper recorded the only sack in the game. S Marlon McCree led the way on defense forcing a fumble and intercepting a pass. San Diego rushed for a total of 214 yards while Denver only gained 72 yards on the ground. Tomlinson carried the ball 21 times for 67 yards while Turner gained 147 yards and 1 TD on 10 carries. QB Philip Rivers looked sharp completing 13-of-18 for 270 yards, 2 TD’s and most importantly 0 INTS. Rivers only connected with 3 different receivers though. Gates caught 7 balls for 113 yards and 1 TD. WR Vincent Jackson was the only WR to catch a pass and he caught 3 for 84 yards and 1 TD. Tomlinson also caught 3 passes for 73 yards. San Diego will try and get back to .500 next weekend when they host the hated raiders.